Mice, fish, cats, dogs, horses, rabbits, monkeys - they're all used in animal testing across the world.Until recently, the US Department of Agriculture used cats to research toxoplasmosis - a potentially deadly parasitic illness usually caught from cats or tainted food.The animals were fed infected meat, and the parasite's eggs harvested for use in other experiments - then the cats were put down.But the department has announced it will stop using the cats after criticism from the public - and the 14 animals left will be adopted.Animals are used in research for various reasons and each country has different rules on what experiments can be carried out. In the UK, the most recent figures show 3.79 million procedures were carried out using living animals in 2017.Half (1.89 million) were experimental procedures which means the animal was used in "scientific studies" to help with things such as: • Basic research (ie the study of biological functions and diseases) • Development of treatments • Safety testing of medicines and other chemicals • Surgical training and education • Environmental research • Species protectionThe other half (1.9 million) were used for the creation/ breeding of genetically altered (GA) animals.These figures refer to the breeding of animals whose genes have mutated or modified. The Home Office, which releases the data, says the number of procedures carried out in 2017 decreased by 4% on the year before.However, the number of procedures has risen 4% over the past 10 years. "This stems from a rise in the creation/ breeding and use of GA animals, largely due to the availability of new technology which has led to new research opportunities," the Home Office says. The majority of experimental procedures (87%) carried out in the UK in 2017 used mice (around 1.09 million), fish (around 308,000) and rats (around 230,000). Other animals that were used included guinea pigs, hamsters, rabbits, birds, goats, sheep and pigs.Cats, dogs, horses and monkeys are classed as "specially protected species" - which means laboratories wanting to use them must show that no other species are suitable before they're given the go-ahead. The figures show 71 cats, 2,496 dogs, 228 horses and 2,215 monkeys were used in experimental procedures for the first time in 2017. The Home Office also records what it calls the "severity" experienced by animals which are used for research.In the figures, pain is broken down into severe, moderate, mild, sub-threshold and non-recovery - which means the animal was put under anaesthetic before the start of the procedure and is killed without ever regaining consciousness.Figures show 5% were severe, 26% moderate, 50% mild, 11% sub-threshold and 7% non-recovery for animals used in experimental procedures in 2017. 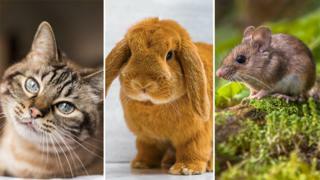 There's a ban on using animals to test cosmetic products or their ingredients in the UK and all other countries which are members of the EU.Since 2013, it's also been illegal to sell cosmetic products in the EU that have been tested on animals.This includes things such as soap, shampoo, deodorant and toothpaste as well as make-up and perfumes.But that's not the case for all of the world. For example, in China and the US there's no national law banning the use of animals in cosmetic testing. The Animals (Scientific Procedures) Act 1986 is the law which covers animal testing in the UK.Under UK law any new drug being developed must be tested on at least two different species of live mammal - one rodent and one non-rodent.The Home Office has rules on how and when animals can be used in testing.Researchers must state the potential benefits of the project and prove there is no realistic alternative to using the animal. Animal testing has been used to research diseases including Alzheimer's, heart disease, HIV and Aids.Chris Magee, head of policy and media for Understanding Animal Research, told Radio 1 Newsbeat: "Research using animals is the reason we have medicines for ourselves and our pets. "It helps us to understand and stop environmental pollution and find ways to stop diseases killing our wildlife. "A lot of people don't realise that in the UK you cannot use an animal for cosmetics testing - or use an animal if there is another way to do an experiment. "We spend millions of pounds every year trying to find alternatives to animals. Once we have an alternative the law says we have to use it. "The experiments mainly use mice and are as kind as they can be, but it is not kind for people to tell medical researchers they cannot do their work when so many people and animals rely on it." Cruelty Free International works to end animal experiments across the world.Dr Katy Taylor, its director of science and regulatory affairs, told Newsbeat: "We estimate that every year at least 115 million animals across the world suffer and die in cruel tests carried out for a wide range of research, including biological studies and the testing of medicines and chemicals. "With the advancement of more humane alternatives, the time has come for us to rethink the use of animal experiments. "Non-animal testing methods are more human-relevant, and often more accurate and less costly, than increasingly outdated and inhumane research using animals. "As a society we should be doing everything we can to move away from cruel animal research and turning to scientifically superior non-animal methods that are increasingly available."